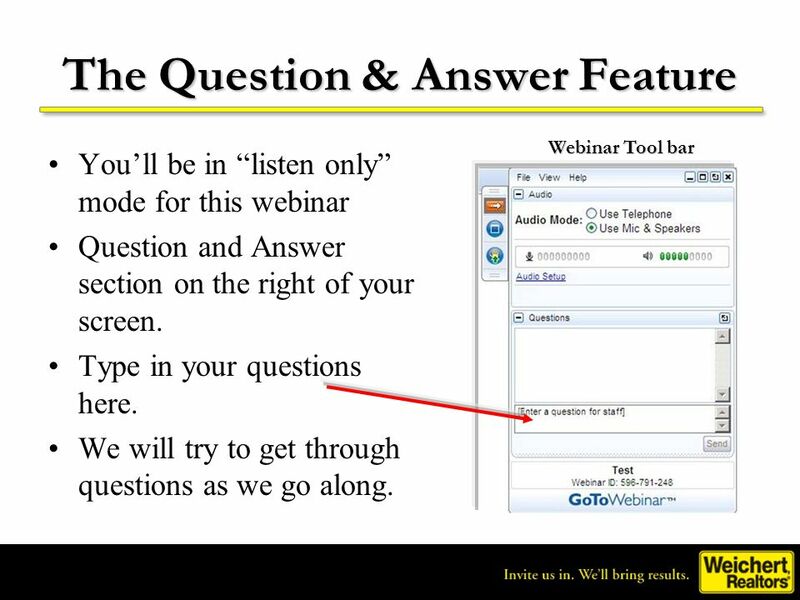 Webinar Tool bar You’ll be in “listen only” mode for this webinar Question and Answer section on the right of your screen. Type in your questions here. We will try to get through questions as we go along. 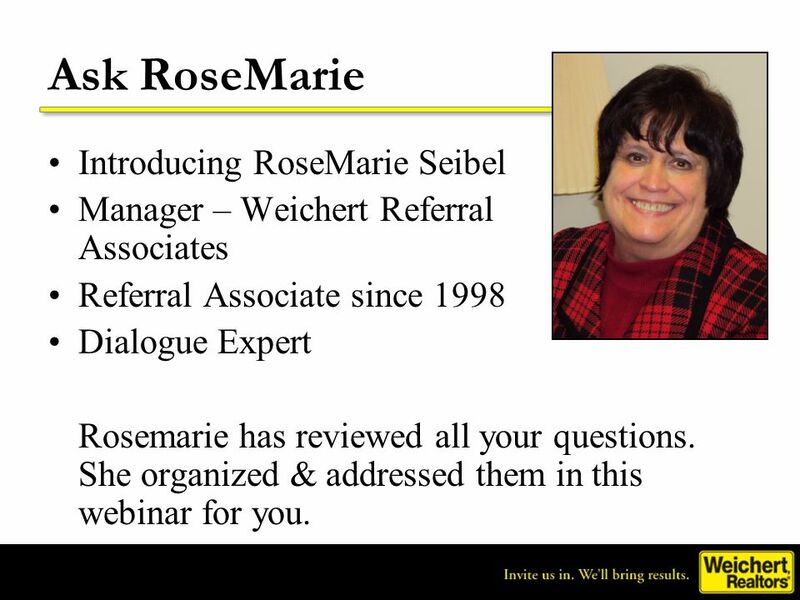 Manager – Weichert Referral Associates Referral Associate since 1998 Dialogue Expert Rosemarie has reviewed all your questions. 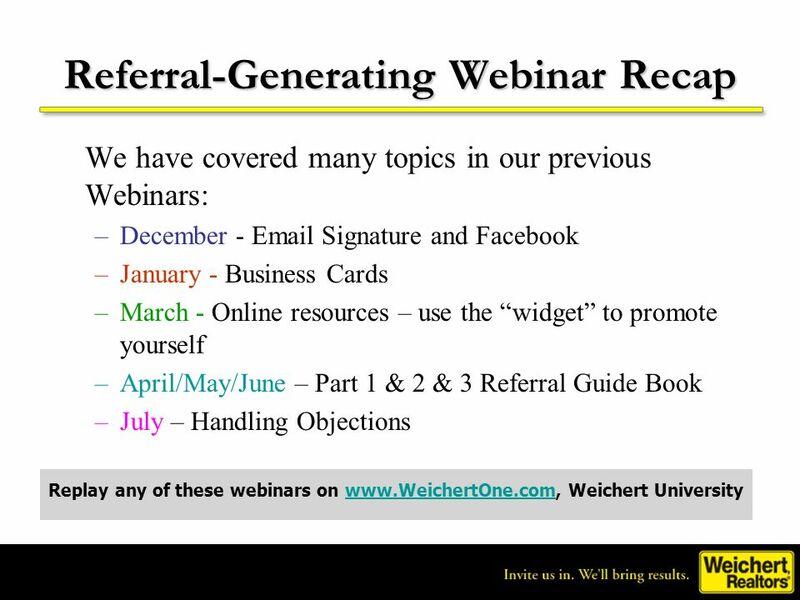 She organized & addressed them in this webinar for you. 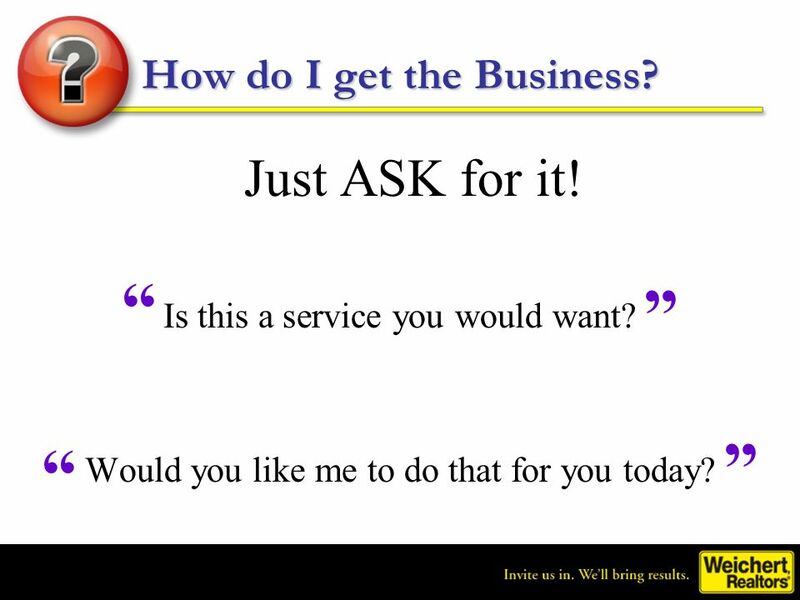 8 How do I get the Business? 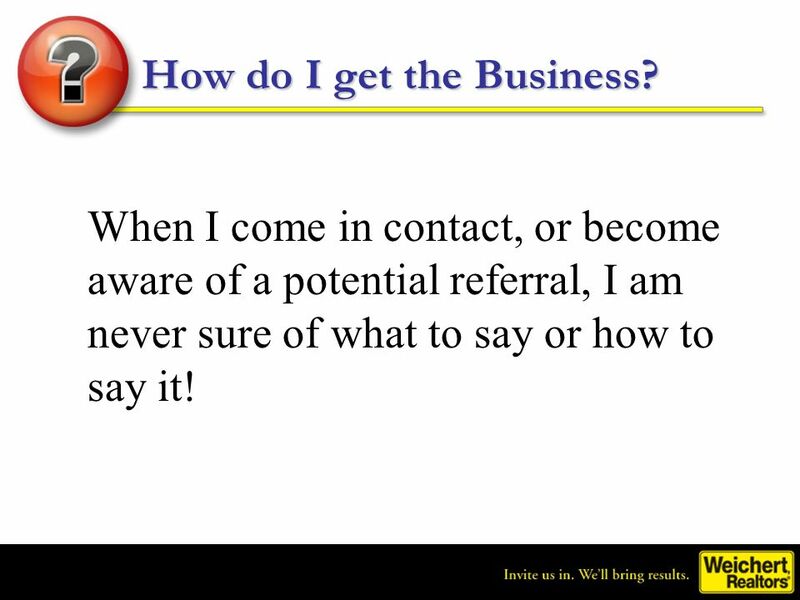 When I come in contact, or become aware of a potential referral, I am never sure of what to say or how to say it! 9 How do I get the Business? 10 Ask, Listen and Learn! 11 Ask, Listen and Learn! Did you say you . . . are looking to move? need a larger home? want to downsize? are expecting another child? have become an empty nester? 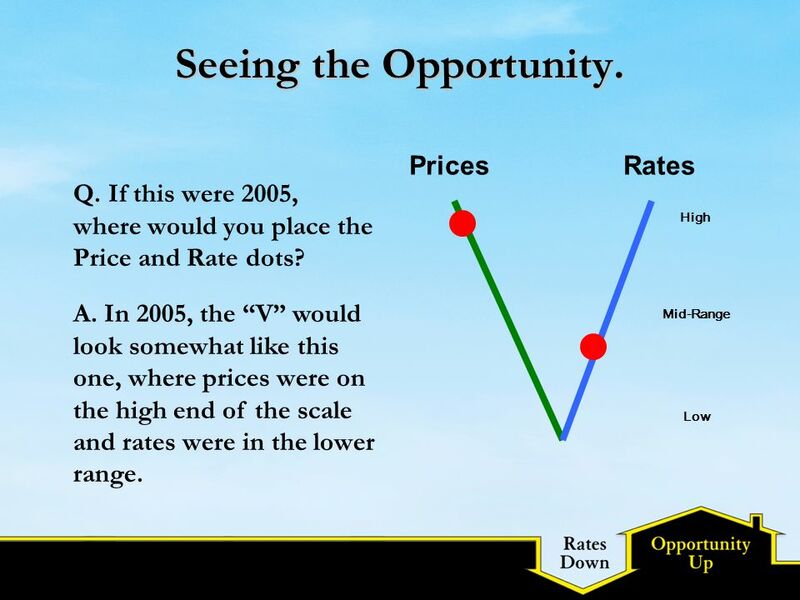 are looking to invest in income property? are looking for a retirement vacation home? 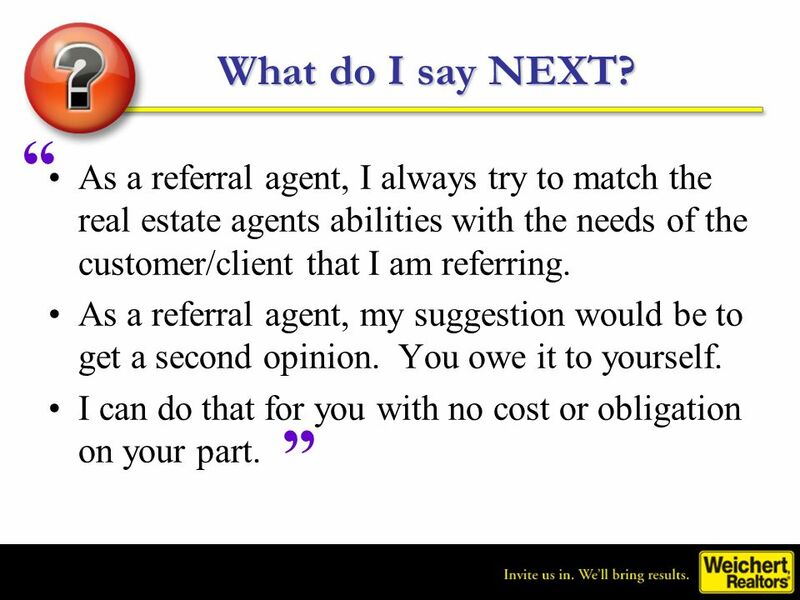 I want to get my house in order before I speak with an agent. I’m not quite sure what I want to do yet. I’m waiting for the Spring market. I’m waiting for the prices to come back up/down. 13 “ ” “ ” “ ” What do you say next? I have a friend in the business. I have someone in mind that I would use. I called a local office. I have been receiving mailings from ____ for years. 17 How do I get the Business? 18 Keep the Conversation Going! 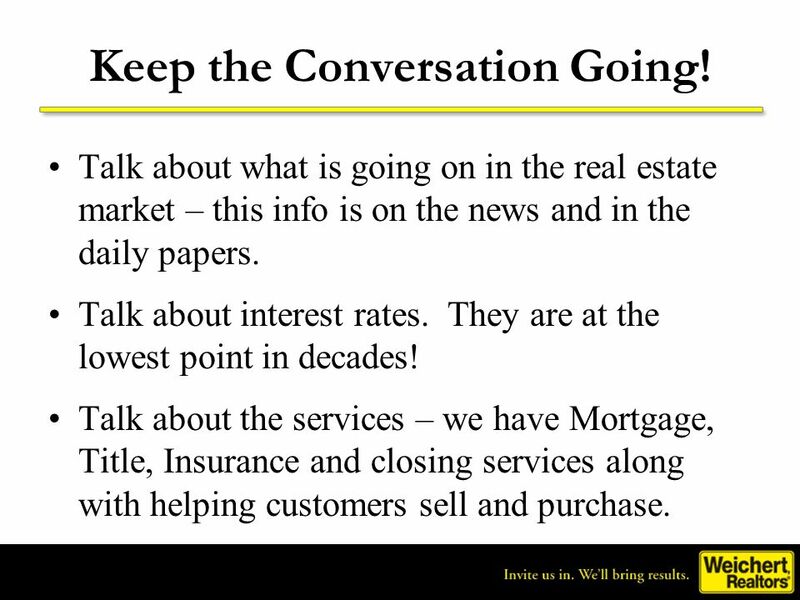 Talk about what is going on in the real estate market – this info is on the news and in the daily papers. 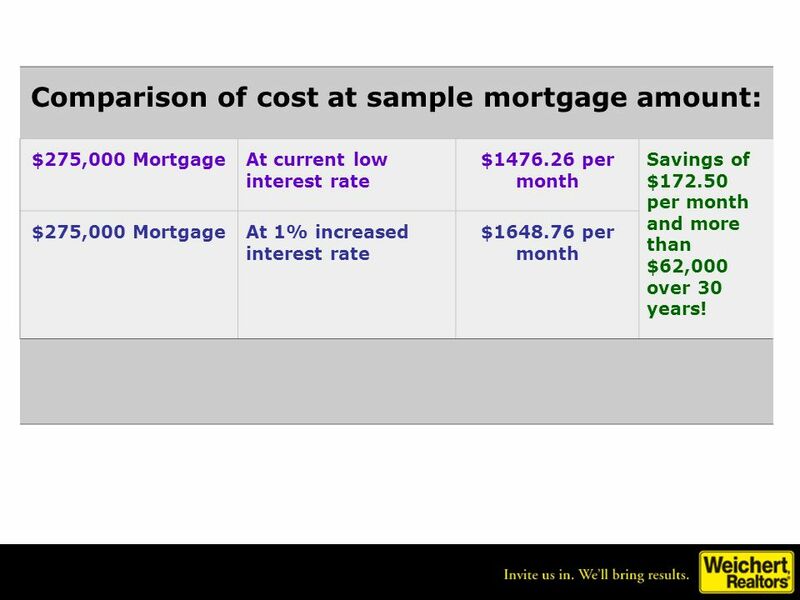 Talk about interest rates. They are at the lowest point in decades! 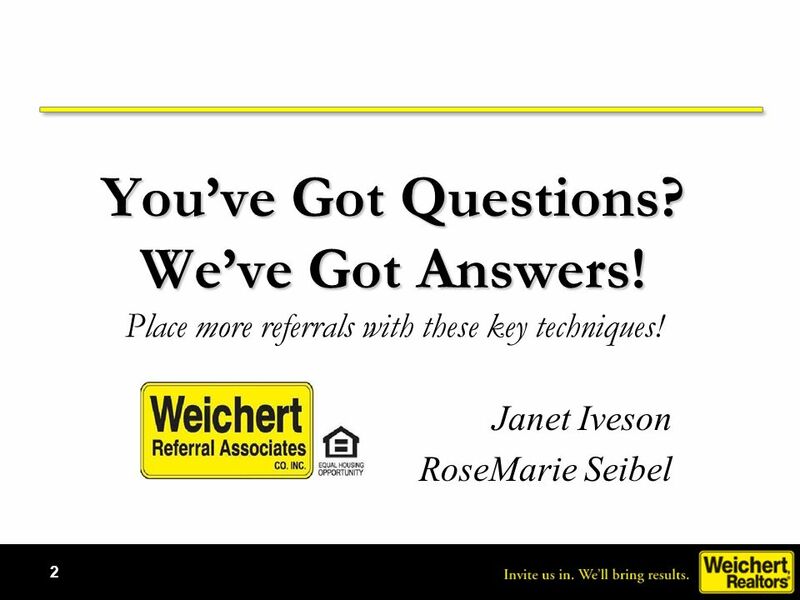 Talk about the services – we have Mortgage, Title, Insurance and closing services along with helping customers sell and purchase. 19 What do I talk about? 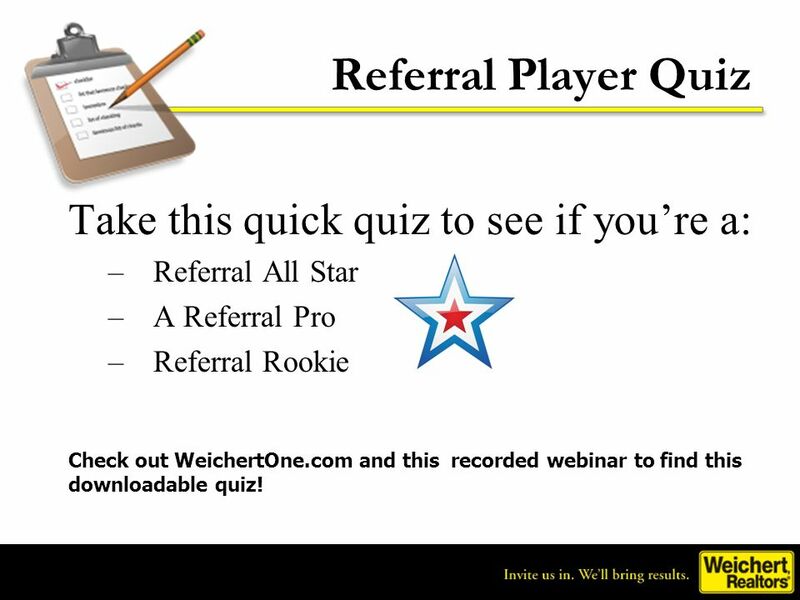 Referral All Star A Referral Pro Referral Rookie Check out WeichertOne.com and this recorded webinar to find this downloadable quiz! 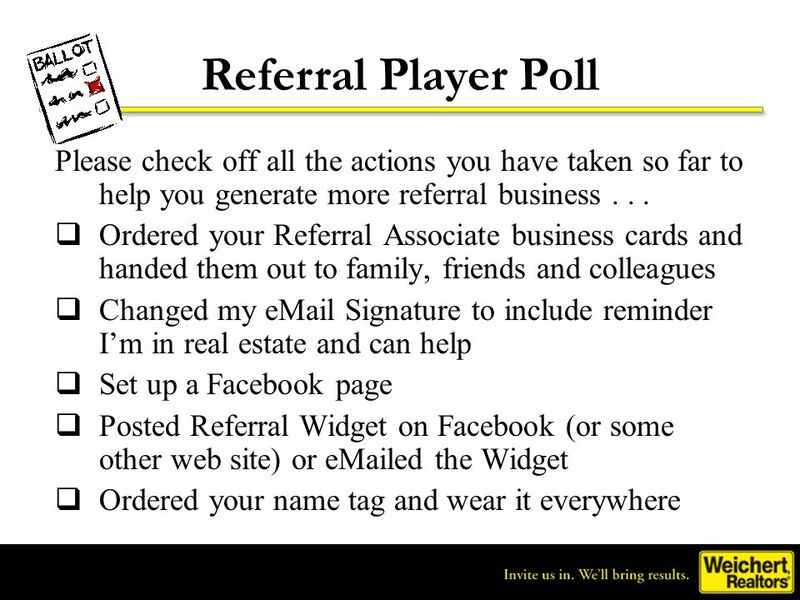 26 Download the FREE Referral Widget! 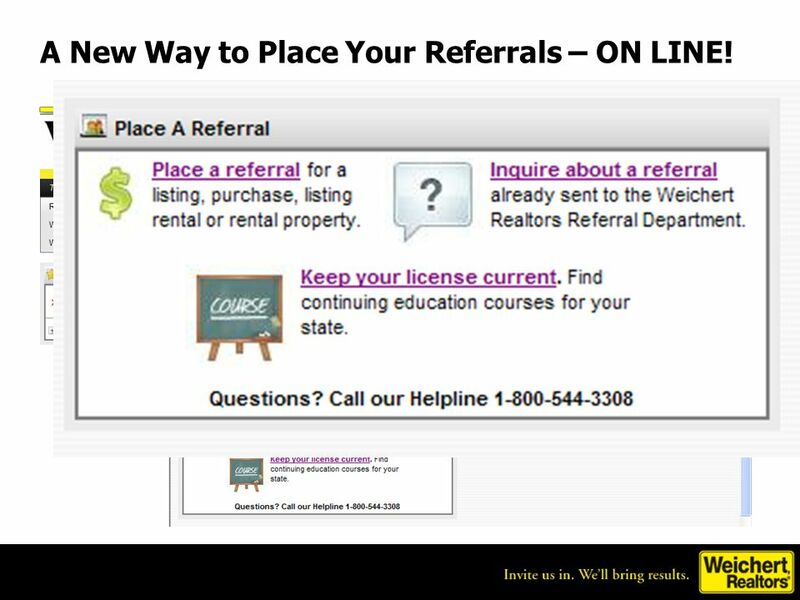 27 A New Way to Place Your Referrals – ON LINE! 29 For more ideas . 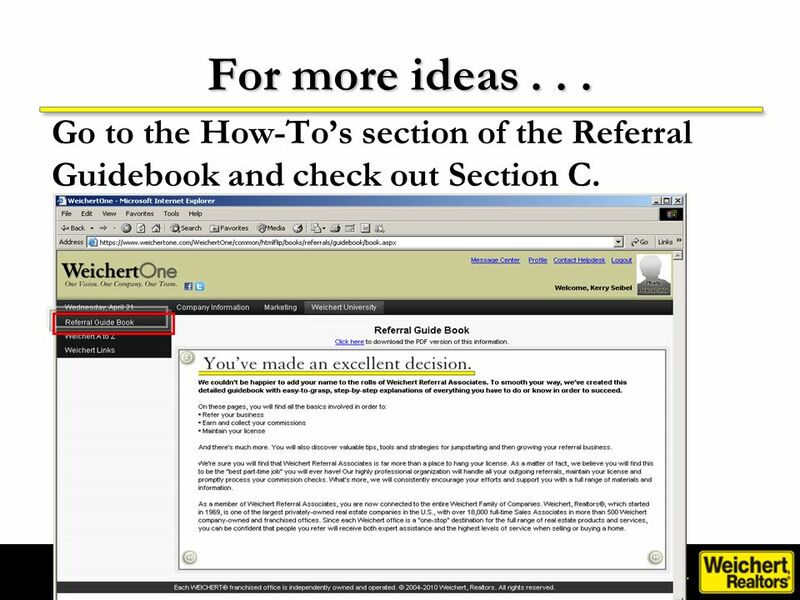 . . Go to the How-To’s section of the Referral Guidebook and check out Section C.
31 Time for our Raffle! 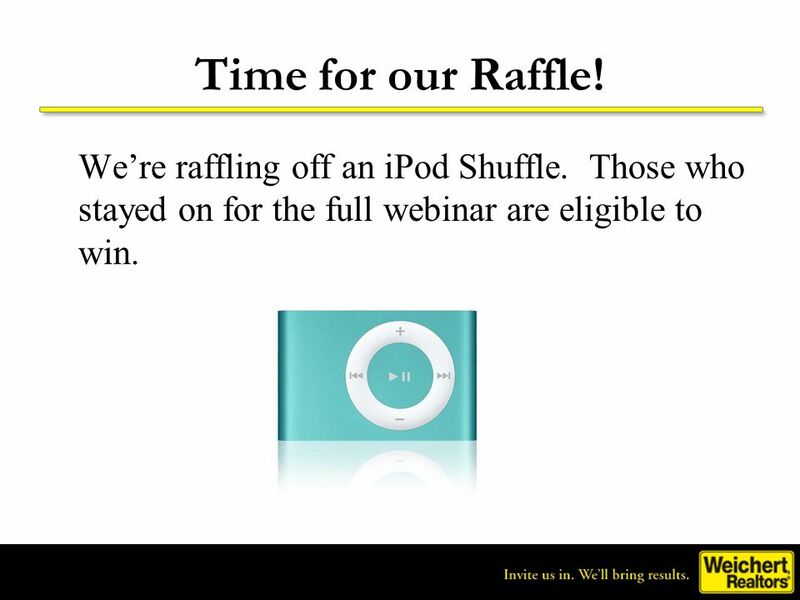 We’re raffling off an iPod Shuffle. Those who stayed on for the full webinar are eligible to win. 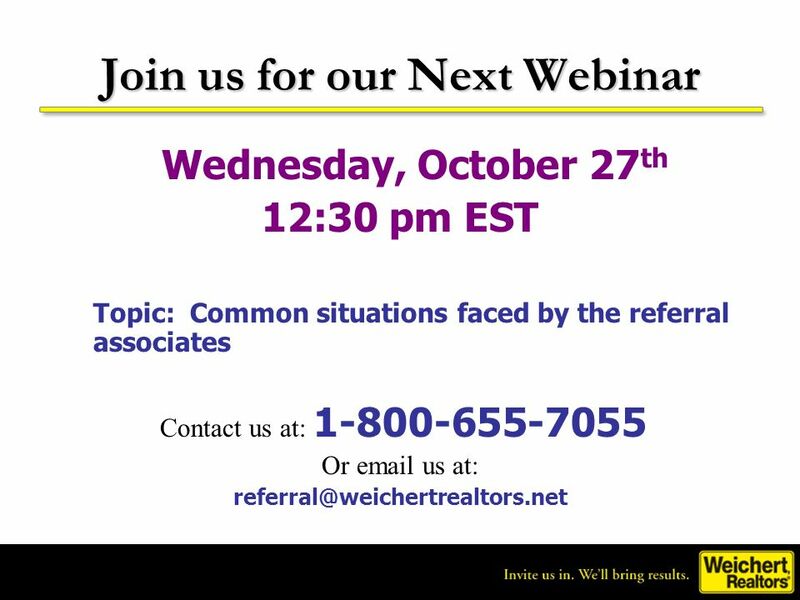 Wednesday, October 27th 12:30 pm EST Topic: Common situations faced by the referral associates Contact us at: Or us at: Please contact us if you experience trouble getting on to WeichertOne. 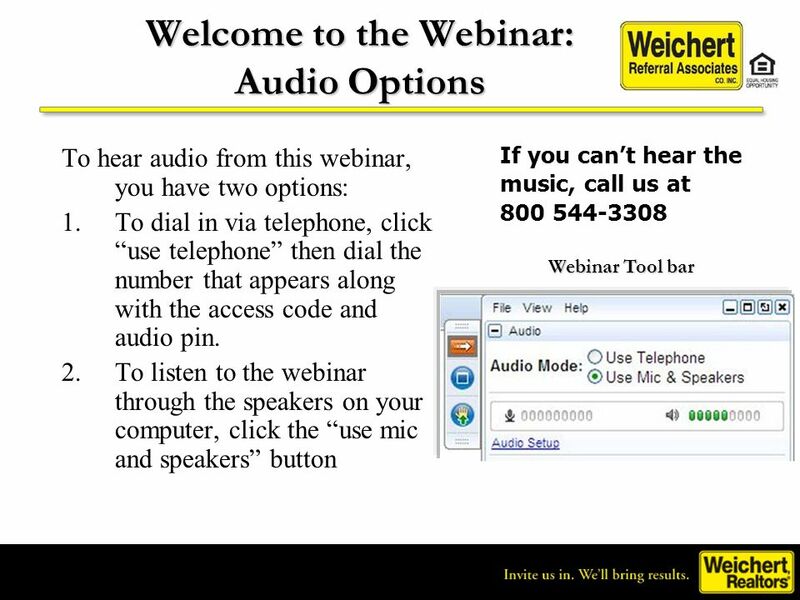 Download ppt "Welcome to the Webinar: Audio Options"
Converting Leads To Listings Overview of Presentation Preparing to handle the lead Staying organized when receiving a lead Introductory activity for. 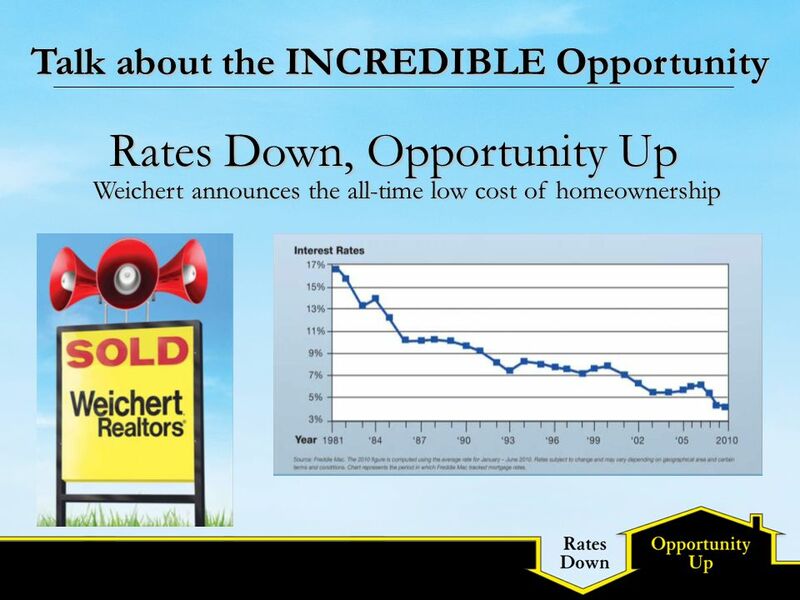 Home of unlimited opportunity. Doing the Twist: A New Approach Doing the Twist: A New Approach. E-books and E-journals Off-campus This presentation will show you how to log in and access Oxford Brookes Library e-books and e-journals when youre off. How To Save Yourself From FORECLOSURE. So many people don’t realize that they can get themselves out of foreclosure! They are unaware of the options and. 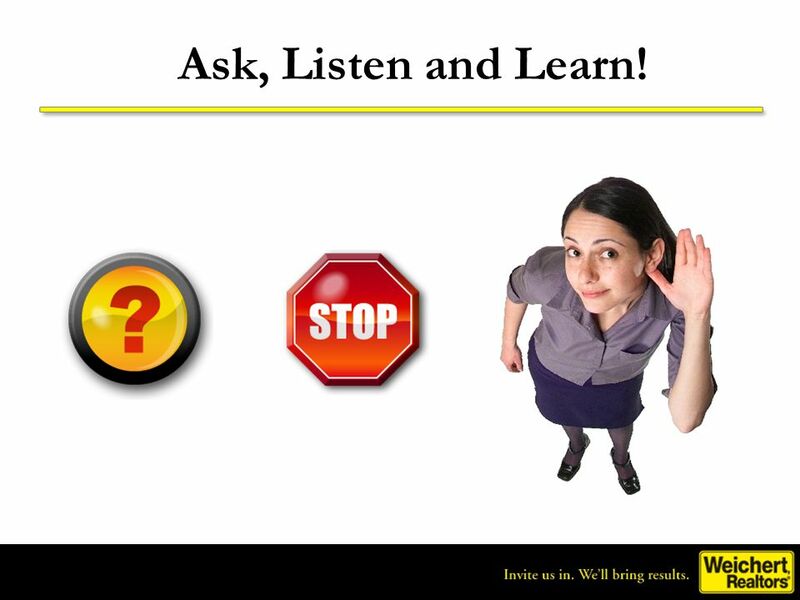 Reconnecting for Referrals *Prep for This Session* Test run the automated pieces of the presentation before the meeting (slides 23-24). Speakers for. 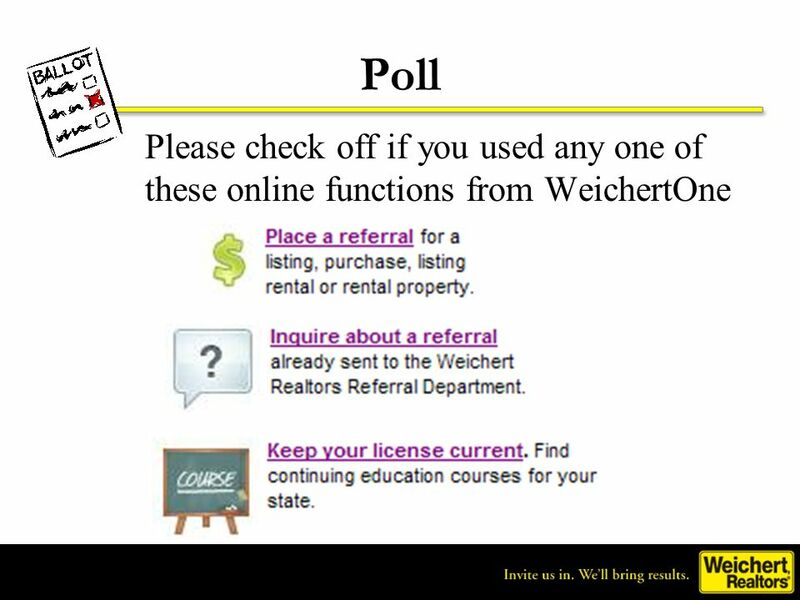 REI ETUTOR Exclusive – Buyer’s List Secret. 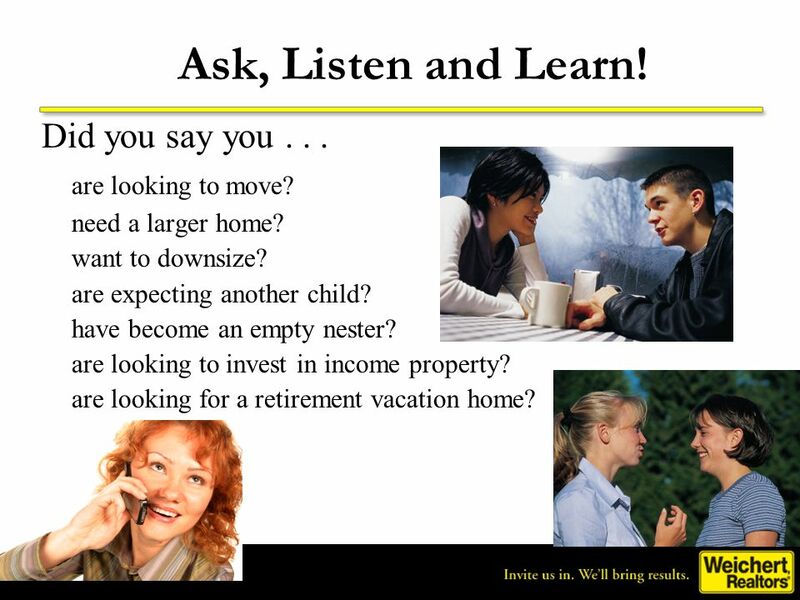 REI eTutor As a real estate investor your buyer’s list is one of your most valuable assets. If you have already. 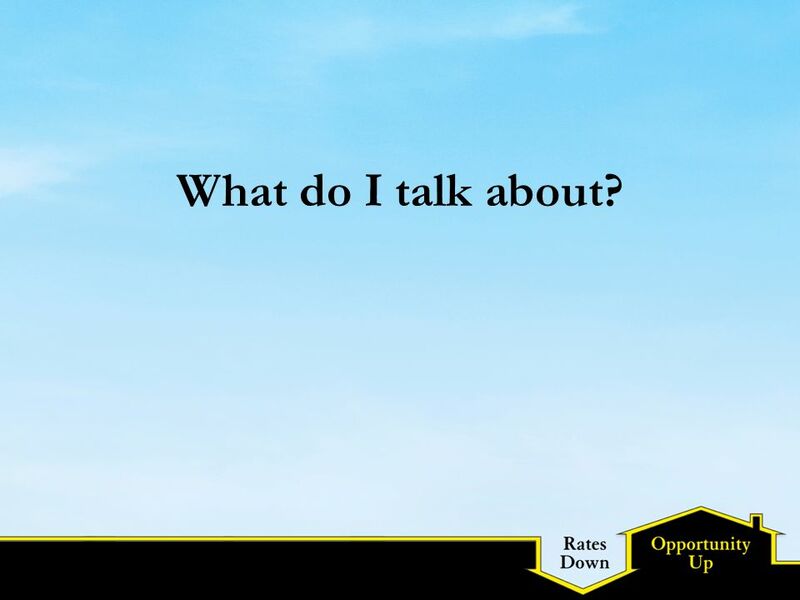 : YOU’VE GOT QUESTIONS…WE’VE GOT ANSWERS. (BUT IF YOU CAN’T HEAR US…DIAL THE NUMBER ON YOUR INVITATION OR DASHBOARD…WE’RE USING PHONE LINES, NOT. Automated Facebook Ads…Made Simple Module 3, Lesson 1 Laser Targeting Your Ideal Customer with Ads. For Sale By Owners (FSBO’S) Not Just for Agents. Why FSBO’s? Just like agents, FSBO sellers get real buyer leads People who buy FSBO listings are NO different. INSTRUCTIONS FOR USE Customize this section with your picture, background and experience, and company/contact information, or delete if you are adding. 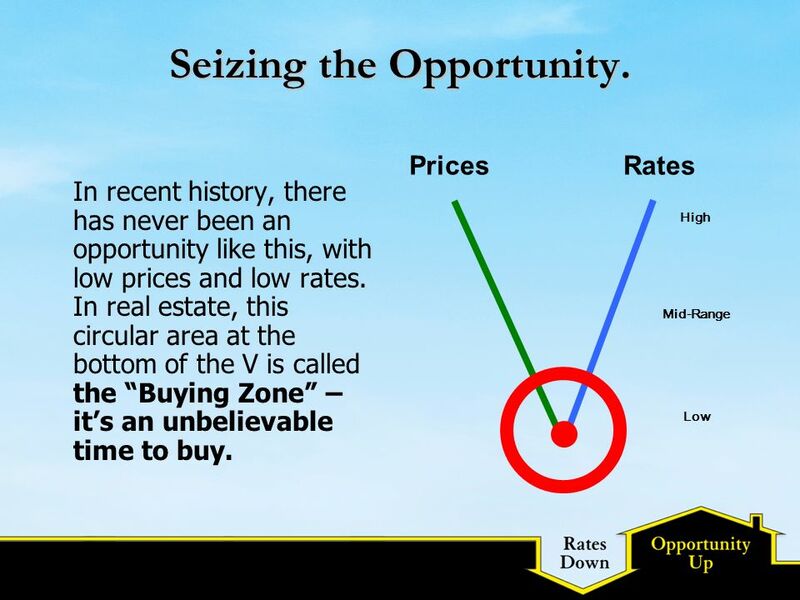 Don't You Agree Now Is The Time To Get Your Home SOLD While Things Are In Your Favor?